In Broadway Court, your home away from home, we offer hotel services with our 70 low-priced high-value clean fortress-like construction one-bedroom and bachelor apartments. All are inside our family's one hectare compound, which is located in a quiet long-established high-end residential neighborhood, New Manila, Quezon City. We offer an alternative for those people who prefer not to stay in high-priced or crowded hotels in busy and noisy commercial areas. We are minutes away from malls, churches, universities, hospitals, and the LRT. Each apartment is completely furnished with its own hot water heater, complete kitchen, air conditioner, cable television, electric meter, and telephone. Each has one queen bed or two single beds. 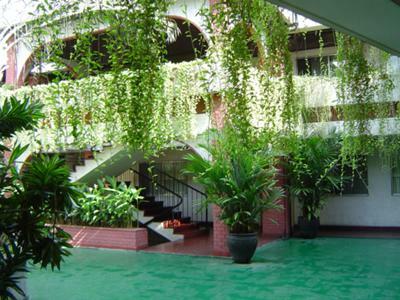 Services include daily room cleaning, 24-hour armed security, 24-hour front desk and phone operator, tennis court and tennis pro, canteen serving Filipino meals, internet, business office, a quite open courtyard for parties, and ample parking space. All-inclusive rates are in the range of $30- per night, $170- per week, and $450- per month (monthly rates do not include electricity). We also offer door-to-door airport pickup and delivery with our own vehicles. Broadway Court Apartelle is truly your home away from your home. The description of the rooms shows that each of the apartments here is superb and comfortable. I would like to see some more pictures of Broadway Court Apartelle. Though the buildings are quite old compare to other buildings in the city, the building is well maintained. The staff, starting from the drivers to the cleaners and the rest of the staff and guards are very polite and you will enjoy staying in the said apartelle. There is only one thing i was not able to ask is the bed, its too soft for my back, i just hope next time i stay there i could request for a harder one. The rate is reasonable and the location is great.You will enjoy your vacation staying in this place.. I hope to be there again this August..
Join in and write your own page! It's easy to do. How? Simply click here to return to Manila Hotels.